This Brain Teaser is going to Test your Brain IQ. This is a difficult brain Teaser which will require you to make some calculations before you can solve this puzzle. In this Brain Teaser, your challenge is to find the 10 Letter Indian City for which hints are given the puzzle picture. 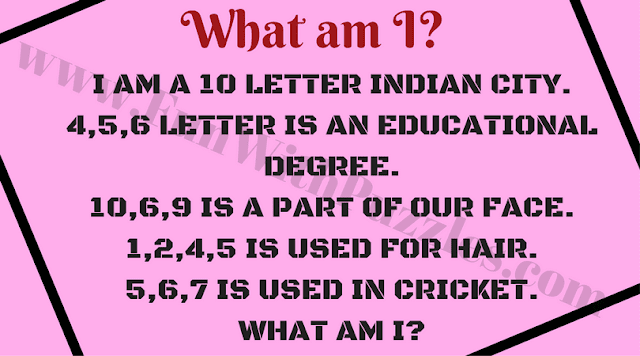 Let us see if you can solve this difficult brain teaser tell What am I? Answer of this "Difficult Brain Teaser for Adults", can be viewed by clicking on answer button. Please do give your best try before looking at the answer. This is a major city in Indian state of Tamil Nadu. 5,6,7 is BAT which is used in the game of Cricket. Your answer to this brainteaser is correct.